The Grecian Archive - Overseas Visitors. 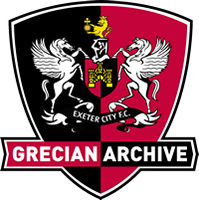 ECFC made a name for themselves with their 1914 South American adventure, but while it was reasonably common at this time for English clubs to demonstrate their skills abroad, it was incredibly rare for foreign sides to visit this country. The first overseas side to play Exeter at SJP was the Polish Navy XI in 1947, but it wasn’t until the resurgence of football teams budgets in the 1950’s that teams started to come to England in order to play in friendly matches. During this time came the visits of F.C. Wien and Grazer Sportclub. With these games occuring shortly after the installation of the floodlights, fans were treated to what felt like a continental style occasion, at a time when European club competitions were on the rise. The trend continued into the 1960’s, and throughout the decade a variety of club and national sides such as, OFK Belgrade, C.A.R. La Paz, Slovan Bratislava, F.C. Kickers Offenbach, and Trinidad came over to test themselves against City. Occasions like these became few and far between in the last 30 years of the 20th Century, with Dutch side Go-Ahead Deventer’s 1970 trip to Devon being the last before the visit of the Brazil Masters in 2004. A year later the Park witnessed the Flybe Festival of Football, where an ECFC XI managed by Alan Banks, took on the Italian ‘Masters’. That day would also see City take on the ‘Bravest Team in the World’ when they played a benefit match against a team comprised of New York fire fighters.